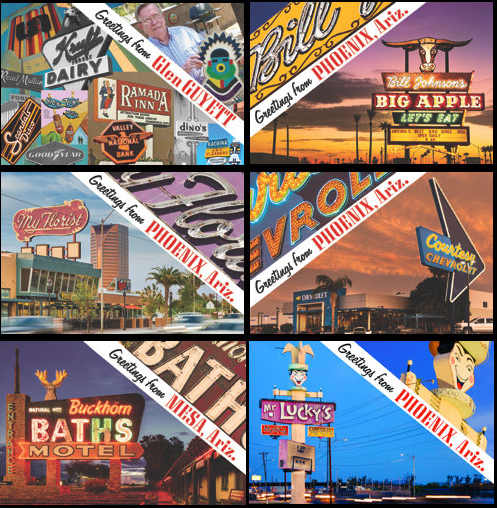 Marshall Shore, Arizona's Hip Historian, has launched a series of postcards highlighting classic neon signs by Phoenix sign designer, Glen Guyett. Created in collaboration with local photographer Leland Gebhardt and artist/designer Stephen Farley, nostalgic postcards capture the beauty of these iconic commercial signs as they continue to define the landscape of the Valley. Phoenix is a Gas are limited edition collectibles done as an homage to the classic Petley view postcards. $2.00 per postcard or $12 for the complete set of six. A percentage of the proceeds from sales benefit neon sign preservation in the Valley. Postcards are available locally at The Clarendon Hotel, Made Art Boutique, Antique Sugar, and Etsy.